Railpictures.ca - Glenn Cunningham Photo: Retired CN SW1200 7304 is switching CN’s Parkdale Steel Centre in Hamilton next to the Grimsby Sub. The sun and blue sky cooperated as the crew pushed this cut into the steel centre for processing. | Railpictures.ca – Canadian Railway Photography – photographie ferroviaire Canadienne. Copyright Notice: This image ©Glenn Cunningham all rights reserved. 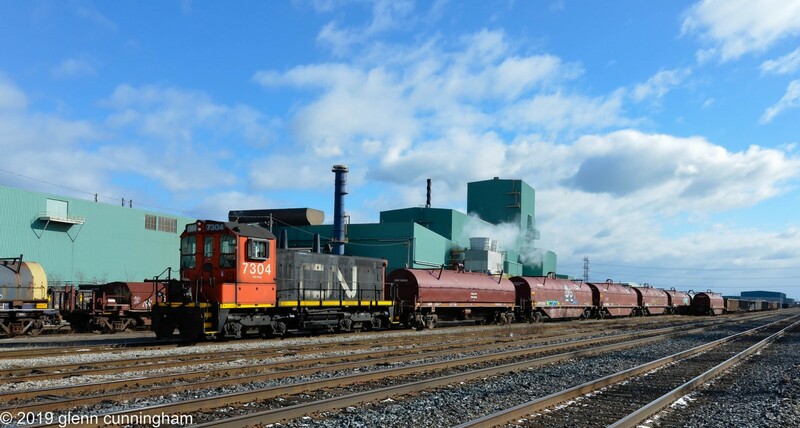 Caption: Retired CN SW1200 7304 is switching CN's Parkdale Steel Centre in Hamilton next to the Grimsby Sub. The sun and blue sky cooperated as the crew pushed this cut into the steel centre for processing.